Pencils Down, Pass the Remote: Who is David Neher? That Neher is some kind of something. Boy, this Neher is all anybody's ever talking about. So sick and tired of hearing about how brilliant that Neher is. Overrated. Alright, so maybe you're not yet tired of hearing about how brilliant David Neher is. That's probably because you don't know his name. However, if you're anything like me, looking at the photos up there is tickling your brain. You're wrinkling your forehead and desperately searching IMDb to figure out just where exactly you've seen that curly head of hair and outrageously proportioned forehead before. You just know he looks familiar, but you don't know why. To answer your question: you haven't just seen David Neher somewhere, you've seen him everywhere. Did you recently check out a show by the great sketch comedy group Upright Citizens Brigade? Or maybe you checked out an episode of Funny or Die's "The Amazing Adventures of David and Jennie"? Or, most likely, maybe you saw Neher in one of his four (!) guest appearances on network sitcoms this fall: he obnoxiously berated Schmidt in the pilot episode of New Girl; was tortured by the study group in Community's "Competitive Ecology"; stole Haley's money in exchange for a promise of fake IDs on Modern Family's "Hit and Run"; and, most recently, offered a pregnant Lily his nachos and some advice on facial hair in "Tick Tick Tick," the ninth episode of How I Met Your Mother's seventh season. 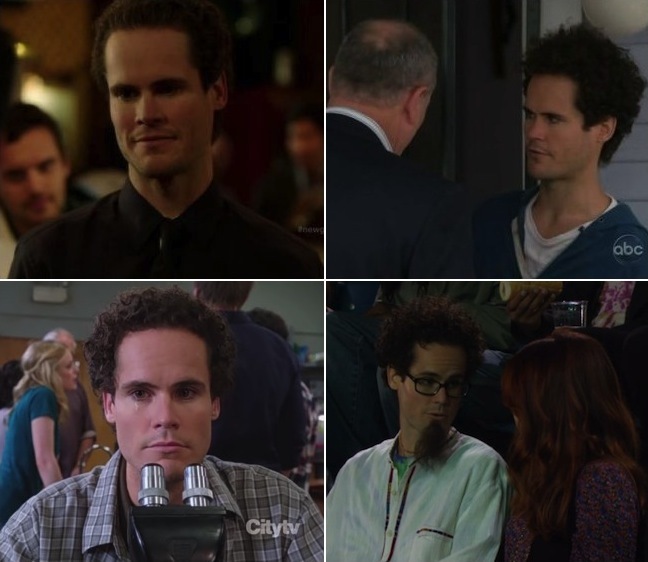 You would think that appearing in sitcoms on each of the four major networks would keep a guy plenty busy, but Neher isn't about to stop. He was just cast opposite Jay Malone as one of the leads on Conan O'Brien's as-yet-untitled comedy pilot for TBS (which is currently referred to as BFF, you know... in case you were interested). Neher will be playing the childhood BFF (and there's why the tentative title is relevant!) of Malone's character, a husband and father who quits his job and moves back to his old neighborhood. BFF may not be the Community spinoff, Todd!, about a young veteran's journey to honor his dying father's wish of finishing college (copyright Alex Israel), that we were all hoping for (and by "we all," I mean only me), but here's hoping the show succeeds anyway. After all, I'd love to be able to remember Neher's name without looking it up on IMDb. Such a hard-working guy deserves that much.